That email was the first in a chain of events leading to the foundation of what is now a thriving department-wide Wellness Program. 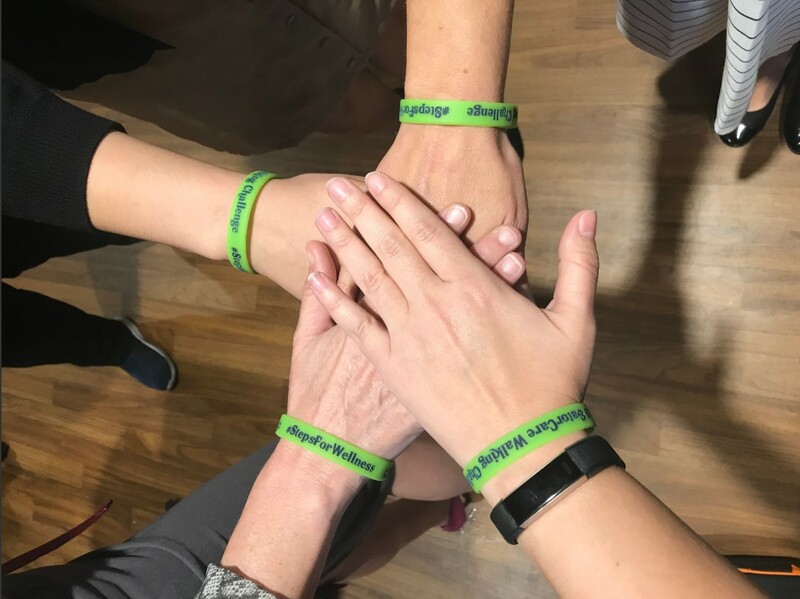 In response to feedback from staff expressing interest in participating in wellness activities, the Wellness Committee came together with the mission of encouraging physical activity and mental well-being among members of the Department of Anesthesiology and thus improving productivity and morale. The Anesthesiology Wellness Program is co-led by Jenny Barghout, Administrative Support Assistant III, and Christina Hendricks, Web Designer. As wellness partners, Barghout and Hendricks serve as the liaisons between the UF-wide program and the Anesthesiology Wellness Program, sharing information and encouraging participation in wellness initiatives, as well as providing feedback to help the UF-UF Health Wellness Committee build a culture of health. “We kind of bounce off of UF’s Wellness Program,” Hendricks said. The program covers eight aspects of wellness: occupational, social, spiritual, physical, emotional, environmental, financial, and intellectual. University employees have access to several opportunities to participate in wellness activities; the UF-wide program sponsors events and challenges, distributes a wellness newsletter, and offers wellness presentations and screenings. The Anesthesiology Wellness Committee promotes these initiatives by coordinating group participation in activities. Since the formation of the Anesthesiology Wellness Program, Barghout said, wellness events such as the walking challenges and a “Plank and Drank” challenge to promote water intake and core strength building have seen strong staff and faculty participation. The program also sponsors recurring events: On the first Wednesday of every month, the committee invites employees to gather during lunch to watch a Wellness Wednesday livestream in which experts discuss wellness-related topics. Past topics have included transforming your workday with booster breaks, vegetable gardening in Florida, and maintaining emotional fitness through mindfulness. Colleen Kearney, Administrative Support Assistant II, has attended several Wellness Wednesday livestreams and has participated in most of the wellness challenges. Her favorites were the walking challenges, which she said provided her daily motivation to exercise. “I like to walk and get my miles in,” Kearney said. “I think my steps varied between 40,000 and 60,000 a week.” She said she appreciates the awareness the Anesthesiology Wellness Committee brings to the department about what programs UF has to offer. Barghout also said the program’s long-term goals include increasing awareness of positive health behaviors, motivating department employees to voluntarily adopt healthier behaviors, and provide opportunities and a supportive environment to foster positive lifestyle changes. Although the Anesthesiology Wellness Program generally follows along with events sponsored by the UF-wide program, the committee has also begun organizing events internally for members of the department. In January, department staff will have the opportunity to participate in an on-site CPR training course. Barghout said the program also hopes to coordinate group activities in the future to promote team building. All members of the Department of Anesthesiology are welcome to participate in the department’s wellness program. Events and activities are announced via email. If you are interested in participating in events or getting involved with the committee, you can respond to the emails indicating your interest.